This week, President Obama spoke to the American people, laying out his plan for defeating ISIS in the Middle East. U.S. airstrikes: Obama said such attacks have already been successful against al-Qaeda in Iraq, Yemen and Somalia. Support to foreign ground forces: He vowed to send 475 more U.S. troops to Iraq to support local security forces as well as provide military equipment and training to Syrian rebels. Counterterrorism: The U.S. will work with allies on intelligence and programs to prevent foreign fighters from joining ISIS. Humanitarian assistance: Aid will go to Muslim, Christian and religious minorities in danger of being driven out of their homes by ISIS. Same old warmongering rhetoric -- leveraging the underlying belief that it is America's responsibility to save one group of Arabs from another. The Iraqi government and Syrian no-government do not have the will, organization, funds or ability to defeat their fellow Arabs. ISIS is growing like a plague. The CIA has said that ISIS has 20,000-31,500 fighters across Iraq and Syria. How many in Iraq and Syria will rise up an fight against them, with the same motivation? Few people had heard of ISIS six months ago, albeit an off-shoot of Al Qaeda. The US-based opposition will not have staying power. 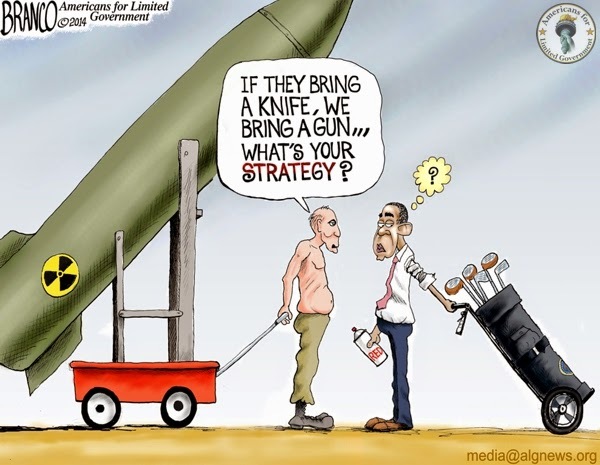 We will bomb -- kill terrorists and non-terrorists. America (and it anti-ISIS alliance) will lose the propaganda war in the Middle East. We always do, helped in part by western (including American) media. We will spend billions of tax-payers dollars on military actions and ordinance. We will loose American lives. But we will be told this is not a war -- not a third Iraq war. Killing them -- terrorist and their leaders -- will do little to moderate their efforts. The number of fighters have increased, not decreased, in Yemen and Somalia since the US attacks started there. Whether it is young ideologues or unemployed with nothing better to do, recruiting hate-America-and-the-West people is not too difficult. This newest foe is a continuation of decades of discontent in the Middle East. It will go on for years if not decades -- long after Obama has played his 10,000th round of golf. We have wasted billions of dollar, thousands of lives and disrupted millions of lives in our so-called war against terror. America's nation-building efforts in Iraq and Afghanistan have been for naught. Part three will go about like parts one and two.